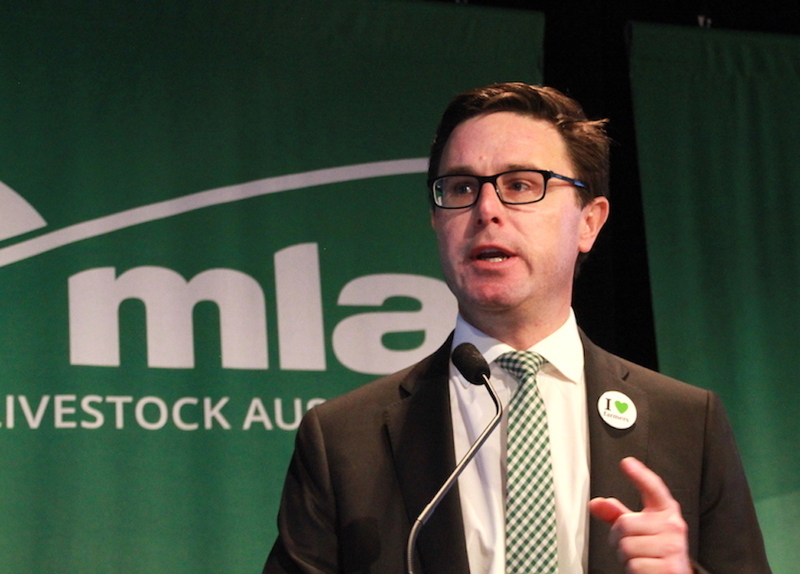 Minister for Agriculture David Littleproud at Red Meat 2018. AUSTRALIA’S move to align its lamb definition with New Zealand gained teeth in Canberra today, with Minister for Agriculture David Littleproud declaring his support for the change at Red Meat 2018. Mr Littleproud said he will change the definition of lamb for export purposes, matching the New Zealand definition and removing the unfair advantage NZ producers had over Australia’s farmers. The new definition, expected to be implemented next year, will also apply to lamb processed for Australia’s domestic market. Mr Littleproud told producers at Red Meat 2018 that he had “signed the paperwork” to initiate the change, which will require amendment to the Export Control (Meat and Meat Products) Orders 2005. “It has taken over a decade, but I have signed the paperwork, I was jack of it, we got it, we got in essence, industry to agree and with science that Meat & Livestock Australia came up with, we will now align ourselves with the same definition as New Zealand, so in terms of those export markets as of today we’re on that journey,” he said to applause from the audience. The Australian Meat Industry Language and Standards Committee has also endorsed the change to the lamb and ovine definitions in the AUS-MEAT Language. A Department of Agriculture and Water Resources spokesperson said Mr Littleproud has signed a brief providing policy approval to make the definition change. “This enables the department to proceed with work to amend the orders. “Industry has been advised that that the new ovine category definitions cannot be applied to Australian ovine meat and meat products for exports until they are legislated,” the DAWR spokesperson said. Register on Federal Register of Legislation. “This would be a disallowable instrument and must be tabled and open to parliamentary veto or disallowance for a set period,” the DAWR spokesperson said. The spokesperson said states and territories are responsible for laws governing domestic lamb consumption. Western Australia and New South Wales have respective legislation with ovine definitions. Mr Littleproud said lamb will continue to be called lamb when the animal has two permanent incisor teeth, so long as those teeth are new and have not begun to wear. “Our export definition will now match New Zealand’s definition and our own new AUS-MEAT definition. “After decades of discussion, the time for talk was over,” he said. “This is a simple common-sense change. 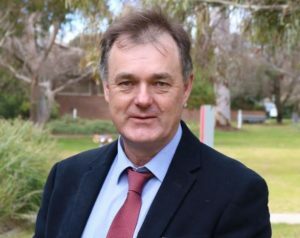 “This will mean our growers can sell more lambs towards the end of the growing season and expand their lamb export opportunities,” Mr Littleproud said. SPA independent chair Chris Mirams. Sheep Producers Australia welcomed the Australian Government’s commitment to pursue the amendments required to change the definition of lamb as the first step in creating an international standard. SPA said support for the new definition was based on the majority of feedback provided during a nine-week public consultation phase, in which 83 percent of respondents to an industry survey supported the change. SPA independent chair Chris Mirams said SPA continued to work on an implementation plan for the change in definition, given it is referenced in various federal, state and industry regulations and standards which require amendment. “The change will allow producers to continue to deliver the quality and consistency in lamb that our customers know and love. “It enables producers to be able to finish lambs throughout the year with confidence,” Mr Mirams said. “The change was never going to be as simple as it announcing it and it taking effect. “There are a number of steps, including changing legislation, which need to occur,’ he said. “With the minister’s announcement that the government will support the industry’s decision with a quick response to change, we anticipate the new definition should be in place in mid-2019. “The new definition will even the playing field with New Zealand in our export markets and provide producers with an indicator before they incur the ‘price cliff face’ of lamb being downgraded to hogget or mutton,” Mr Mirams said. SPA said the lamb definition review is part of a broader ‘Fit for Purpose Language Program’ it has undertaken. The program aims to enable the introduction of meat and livestock specification language that strengthens the connection between consumer price signals and on-farm decision-making. Enhanced alignment will assist in producers being paid for the product attributes that consumers value most at the dinner table, SPA said. Australian Meat Industry Council chief executive officer Patrick Hutchinson said Mr Littleproud’s progress in changing the Export Control (Meat and Meat Products) Orders is a win for all participants in the lamb production supply chain. “Australian lamb producers will now have a clear physical signal to inform their selling decision and will create markets for unfinished lambs that buyers have previously been reticent to purchase for fear of the lambs crossing the threshold to hogget or mutton. “Australian processors will have access to lambs at the cross-over period between new season lambs and those from the previous season and will have confidence that producers were able to finish those lambs to a better quality without concern that they will miss the lamb specification,” Mr Hutchinson said. “Retailers and consumers can expect to see an improved supply of lamb in store as producers confidently carry lambs through winter. AMIC said while a date for implementation is still to be set, the processing and producer sectors will continue to work with the Department of Agriculture, AUS-MEAT, MINTRAC and MLA to ensure a smooth transition to the expanded lamb definition. All supply chain participants, from producers to processors, should be aware that the change has not yet come into effect. Sheep with permanent incisors are not yet able to be sold as lambs, AMIC said. Lamb and mutton exports were worth more than $2.6 billion to the Australian economy in 2016–17, with lamb alone worth more than $1.9 billion. Current members of the Australian Meat Industry Language and Standards Committee include the Department of Agriculture, Australian Meat Industries Council, Sheep Producers Australia, Cattle Council of Australia, Australian Lot Feeders’ Association, Australian Pork Limited, Australian supermarkets and independent retailers. This is an historic decision and one that members of AMIC have been working towards for the past eight years. Well done, Roger Fletcher, Brian James, Frank Herd and Garry Hardwick.